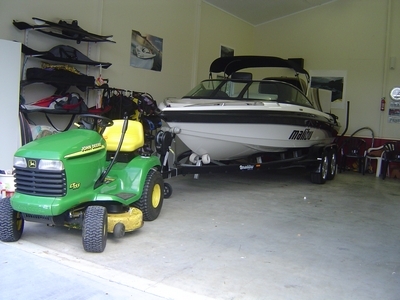 Buying a new house, wondering if a 500 or 600 four wheeler will be able to move a boat short distnaces in the confines of a driveway. How would you attach it - would it have to support the weight of the toung? 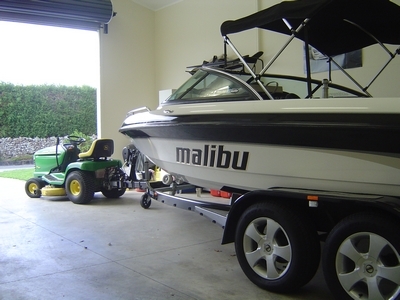 hitch, I have moved 10 guys on a util trailer at speed with a 500, just wondering how would it work with a 4k boat.? I've moved around a few boats with a 4 wheeler, it can be done, depending on the surface and the incline. Also tandem or single axle trailer? We use a John Deer Gator with a hitch on the back to move the boat into place. It works wonders, but you need to go slow. It's a 2WD. One of these will, unless you already have the 4 wheeler. There are several more brands out there. Sorry...I'll delete it if you need me to. ...would it have to support the weight of the toung? I don't know, what's a toung weight?... ...come to think of it...what the heck is a toung? id dat won uh does dings dat ya serb salid wit? It'll move it no problem. We often move in and out of shows with 4-wheelers. They aren't set up for the tongue weight, but they work just fine. we towed my buddy's ps 190 w/ 3 people and a 500 lb sack up the ramp and a quarter mile back to the house with a polaris ranger 4x4. another idea would be something like this: http://www.dragger.com/home.html . Screw the 4 wheeler. Buy a BIG propane fork lift for the job. Then you can move your Bu AND add 3-4 to your C.I. Can't get the drawbar down low enough. Looks like you'll need DUBs on the Deere! that's the kind of thinking i like to see!! I've pulled boats around with our 400 Xplorer 4x4 in low range before. Doesn't seem to have much of a problem with them.